These words will reach few ears. —But you hear them, because you and I share in community life. Communities gather about ideas. Before we ever met, something about traffic safety attracted us. Individually, we valued the idea. Then, our values inspired us: we resolved to interact. The idea brought us together. Now, it impels us toward richer interactions, for which reason we say our community, the Vision Zero community, lives. Community life—fragile—is perpetuated, but with difficulty. Surviving requires sustaining the idea that brought us together. Like a neglected egg, that idea’s vital goop could easily dry up, leaving only a hollow shell. Hollow ideas inspire no one. And, about hollow ideas, one never finds community life thriving. Of course, to abandon traffic safety, forsake our community—unthinkable! Too many lives are at stake. Traffic safety is too valuable. As a hen tends her egg, therefore, to preserve the idea’s substance is our duty. We must ensure that traffic safety can be valued—that, for a long while yet, people will consider it, advocate it, glorify it. Only if the idea is sustained will the Vision Zero community live on. If we fulfill our duty, the phrase “traffic safety” will mean more than the words that constitute it. The idea will produce real effects, real changes in people’s lives. That is our goal—but, are we doing it right? “Don’t drink and drive,” “buckle your safety belt”—do these familiar maxims sustain the idea? Was any of them the something that initially attracted you? If we are honest with ourselves, we have to admit that traffic safety, as it sits before us in its nest of twigs and string, needs something more—elaborate. The problem, precisely, concerns the idea’s capacity to penetrate into people’s everyday thoughts and feelings, to connect discrete experiences that, when connected, make the logic of safe driving intuitive. If “don’t drink and drive” and “buckle your safety belt” scarcely prick the surface, can we yet sharpen them? 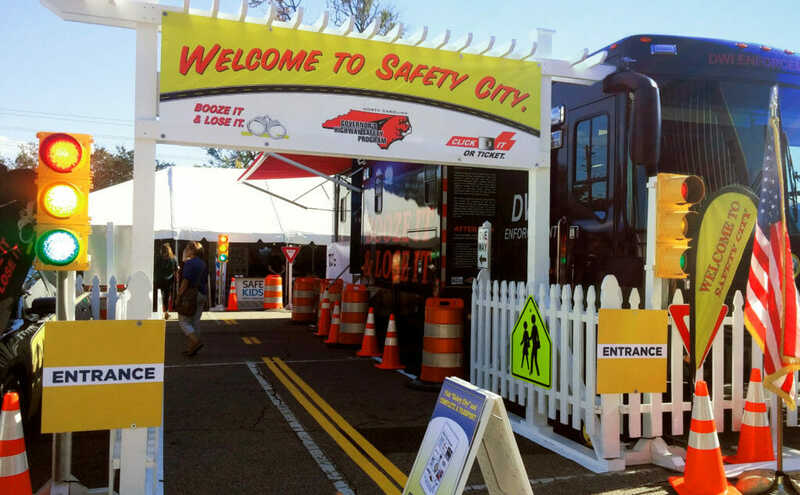 At the North Carolina State Fair, from October 12th to the 22nd, one can find an exhibit designed with just that intent: Safety City. Safety City is, foremost, about community. Like a city, Safety City incorporates different communities. Functioning as a sort of traffic safety hub, it facilitates new interactions. NC Vision Zero, MADD, Safe Kids, BikeSafe, BeRailSafe, Watch for Me, the Governor’s Highway Safety Program, and various law enforcement organizations all unite there, not to bore people with dry, moralizing speeches, but to demonstrate, tangibly, the meaning of traffic safety. Put a boy in the Seat belt Convincer—he learns the meaning of prudence; give him a pair of alcohol impairment simulation goggles—he learns the meaning of temperance; show him the inside of a B.A.T. mobile—he learns the meaning of justice; call him to sign the Vision Zero pledge—he learns the meaning of fortitude. At Safety City, a boy can learn all these virtues good citizens display and—what’s most important for our goal—their relation to traffic safety. As he grows and, eventually, learns to drive, he will connect new experiences with the ones he had at Safety City. Making those connections, he will naturally display the virtues he learned as a boy. Then, as he continues to grow, the idea will incubate in his mind. He will begin to consider it, advocate it, glorify it as we do—and, on that day, our goal will have been achieved. The Vision Zero community’s continuance will have been secured. Sustain the idea! Come to Safety City!